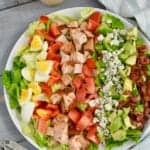 This Cajun Cobb Salad Recipe is such a delicious twist on the original and filling enough to be dinner! With some homemade Cajun Seasoning recipe on hand, you can make this salad and it's amazing Cajun Ranch Dressing all the time! 6 slices of bacon diced and cooked until crisp. Combine all the ingredients for the salad in a large bowl and set aside. Whisk together the buttermilk, sour cream, and mayonnaise until smooth. Stir in the garlic, salt, pepper, dill, lemon juice, and Cajun seasoning. Serve the dressing on the side. The recipe for the dressing makes more than you will likely need, serve on the side and allow people to dress their own salads.